Located in Bethlehem, Pennsylvania, John R.K. Solt, P.C., has been serving clients in the Lehigh Valley for 40 years. The law firm, headed by attorney John R.K. Solt, offers full-service representation in bankruptcy law to individuals, businesses, trustees and creditors. It would be difficult to practice law for 40 years without the support and recommendations given by satisfied former clients. Attorney John R.K. Solt continues to practice in the Lehigh valley thanks to his reputation for client-focused service, professionalism, and legal skill. To learn more about how John R.K. Solt, P.C., can help you, give the firm a call today. My areas of practice include bankruptcy, real estate, business law and estate planning. I welcome the opportunity to serve you. Bankruptcy stops creditor harassment and provides excellent relief for those who qualify. 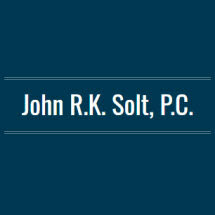 Learn more about attorney John R.K. Solt and his experience. Contact the John R.K. Solt directly from his website.